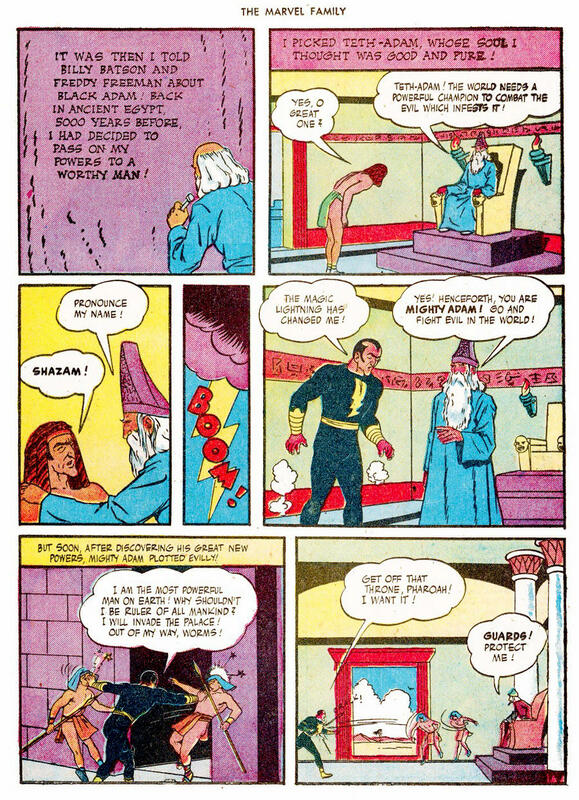 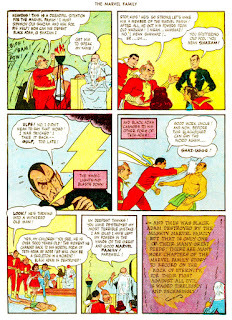 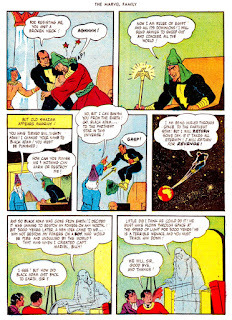 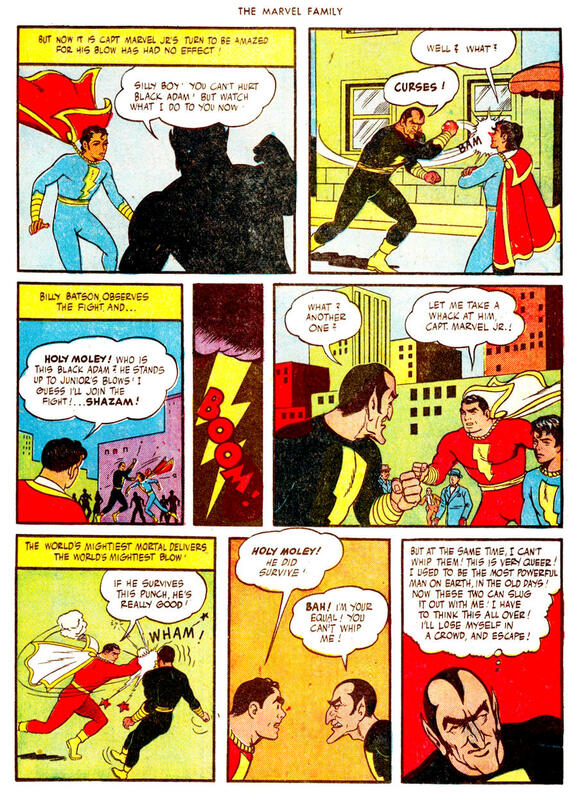 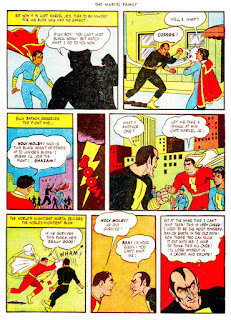 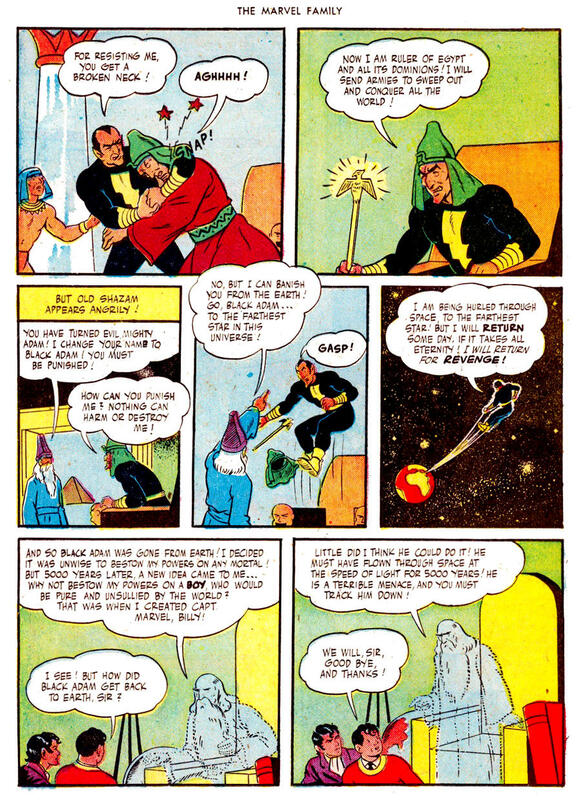 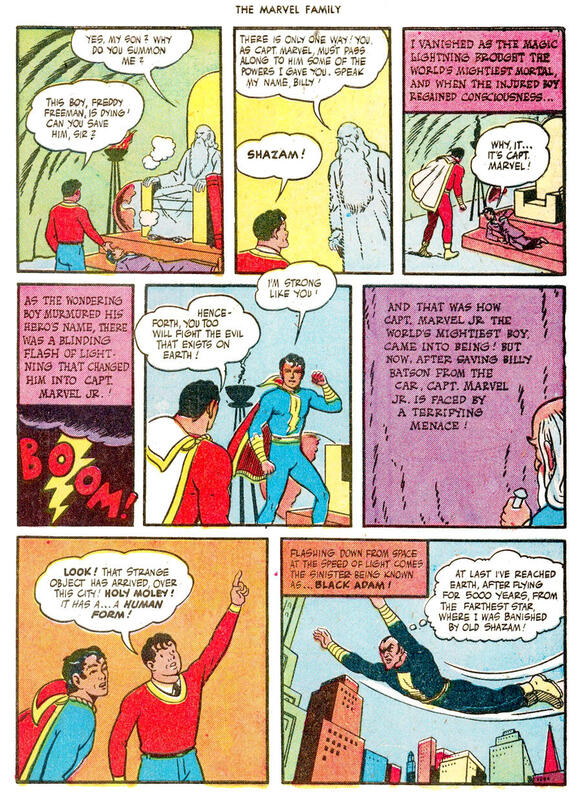 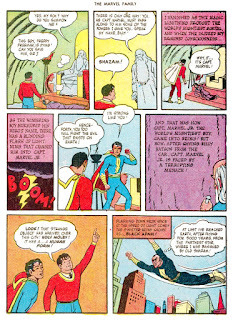 Old Shazam blew it when he gave powers to Black Adam (Shazam called him Mighty Adam originally), who was created as an evil version of Captain Marvel. 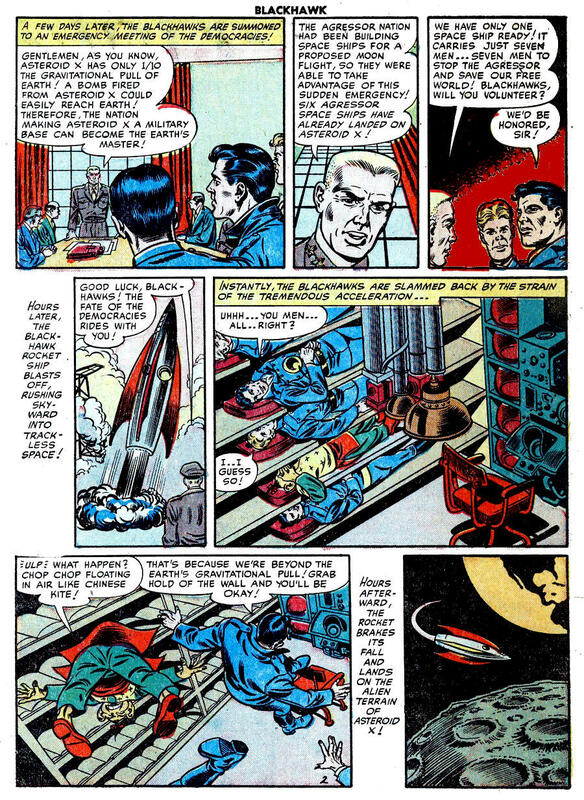 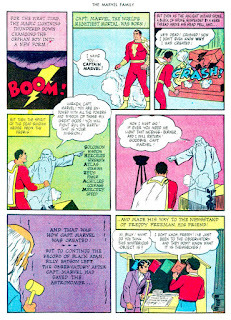 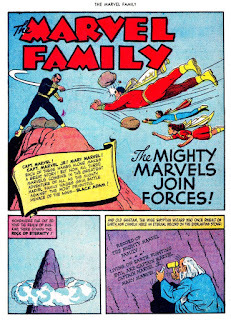 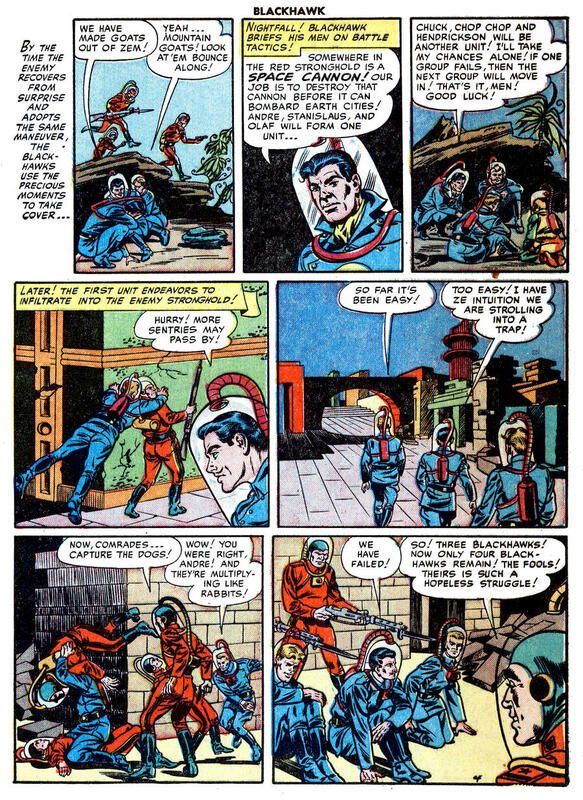 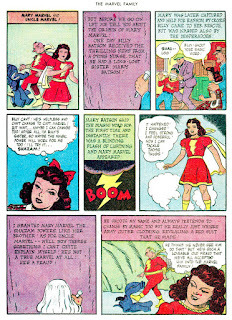 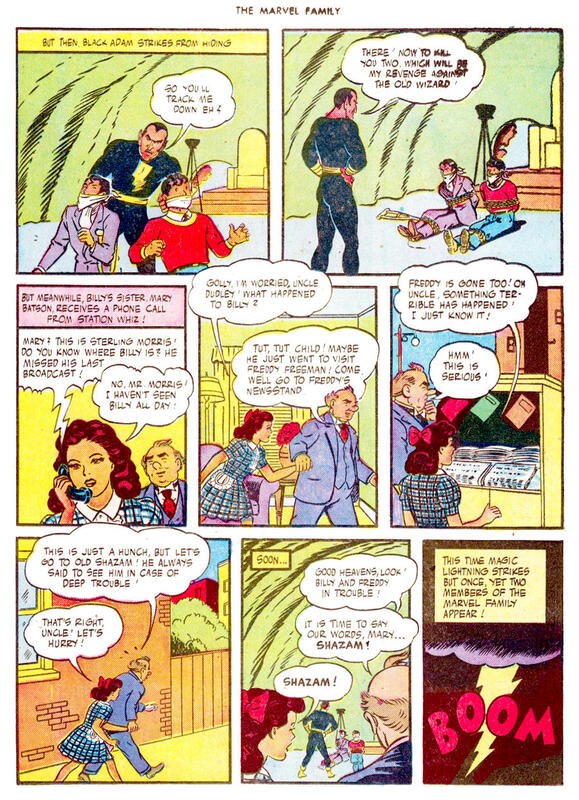 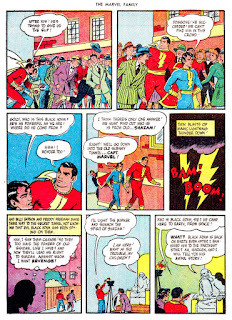 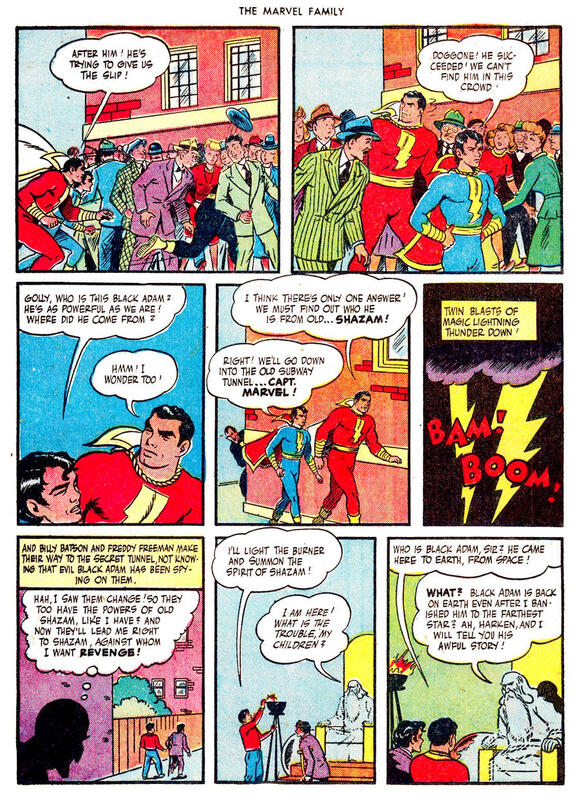 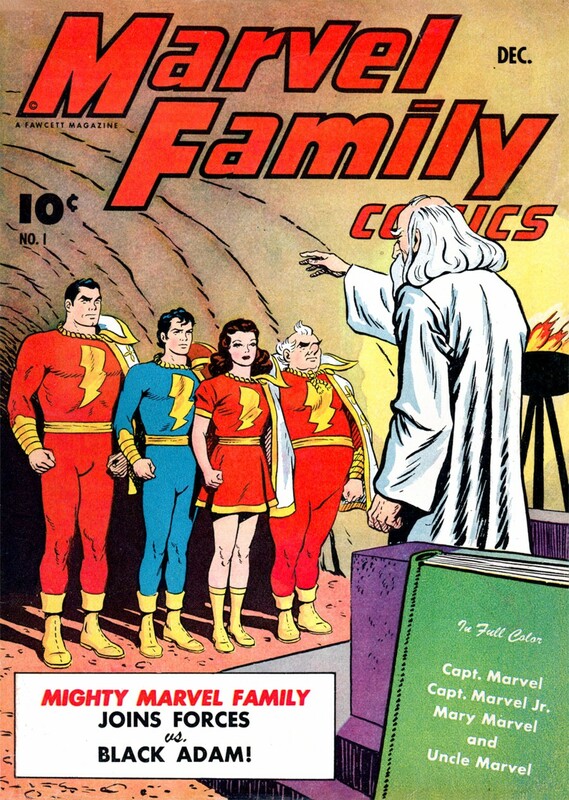 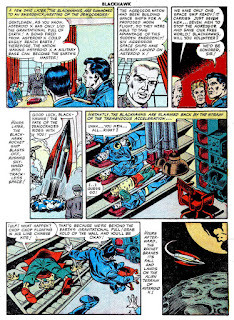 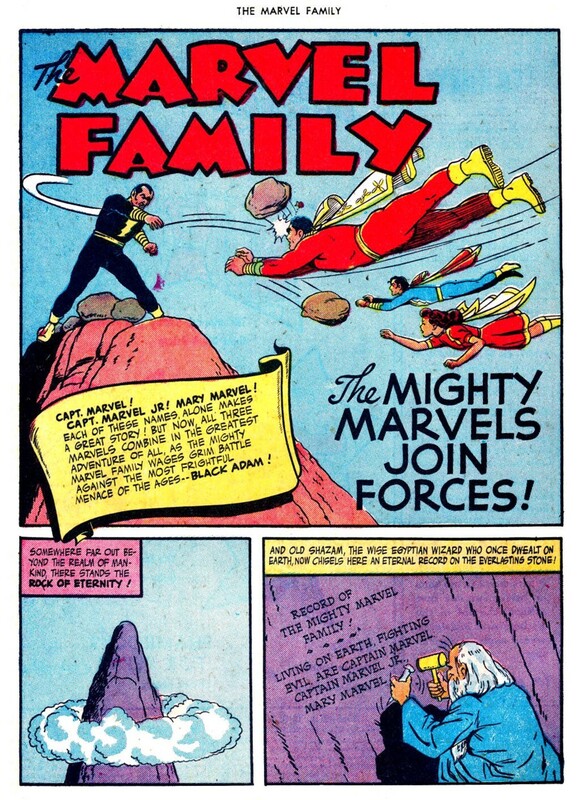 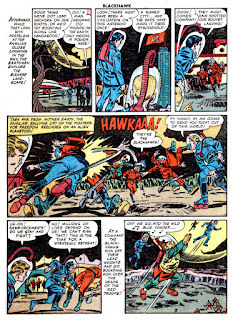 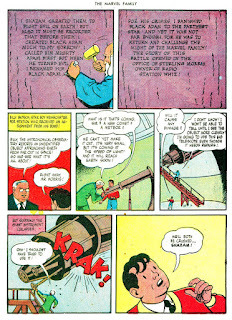 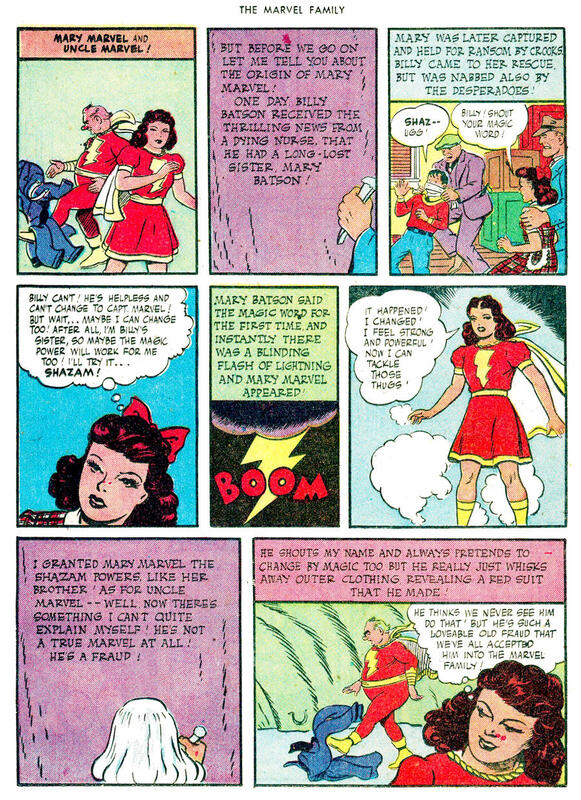 In looking at the Grand Comics Database for the issue this story appeared in, Marvel Family #1 (1945), I see this origin story has been reprinted several times since DC Comics acquired the rights to Captain Marvel in 1973. The character is an interesting bad guy, but it appears no one at Fawcett had any plans to keep him on as a resident menace. 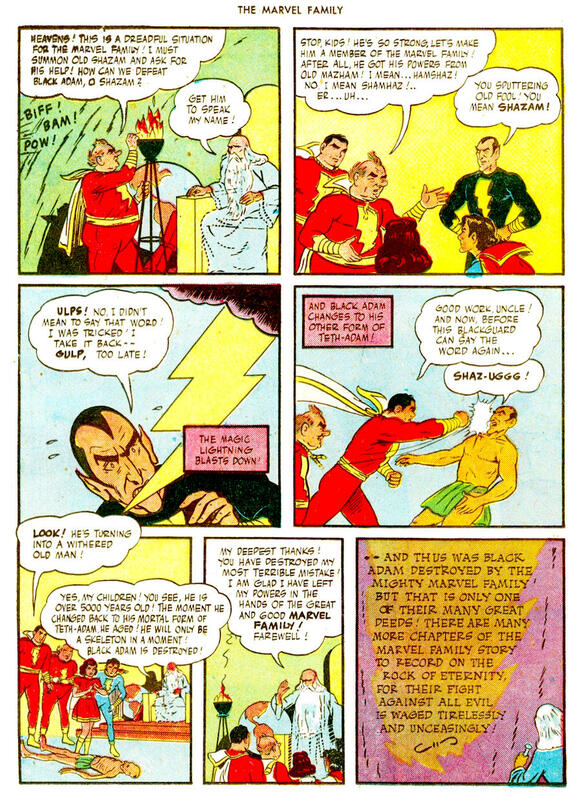 A Wikipedia page gives information about Black Adam’s appearances after the character was revived, but I keep it simple here at Pappy’s. 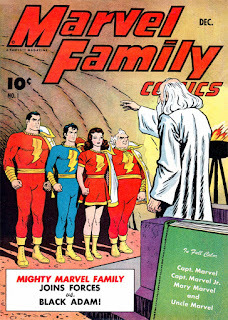 In keeping with my simple mind, I stick with the Golden Age versions only. 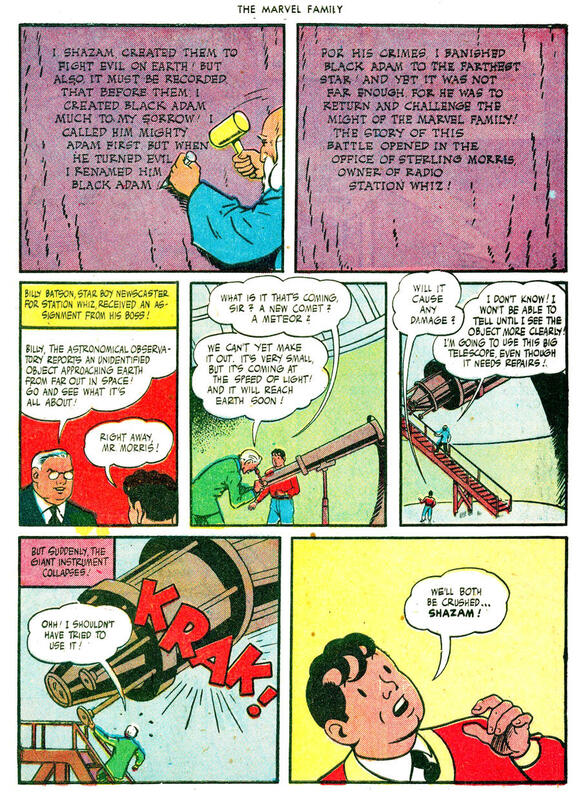 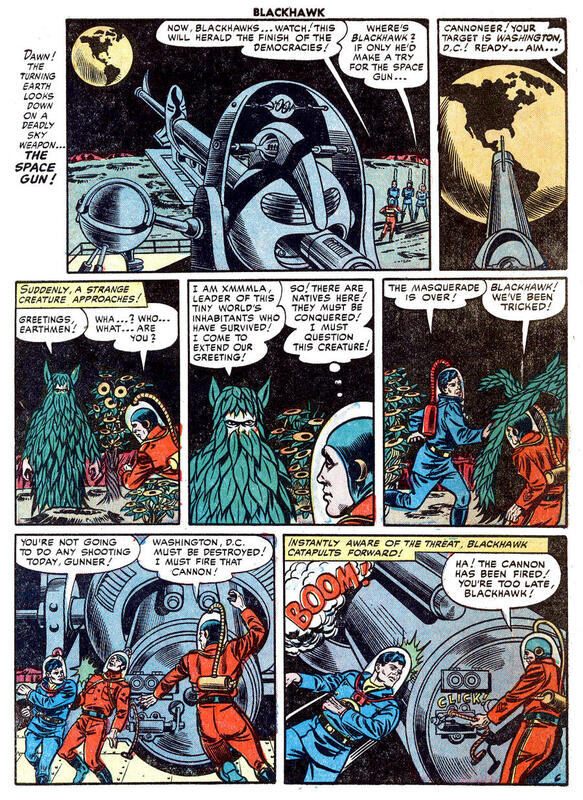 Otto Binder wrote it, and C.C. Beck and Pete Costanza are given credit for the artwork. 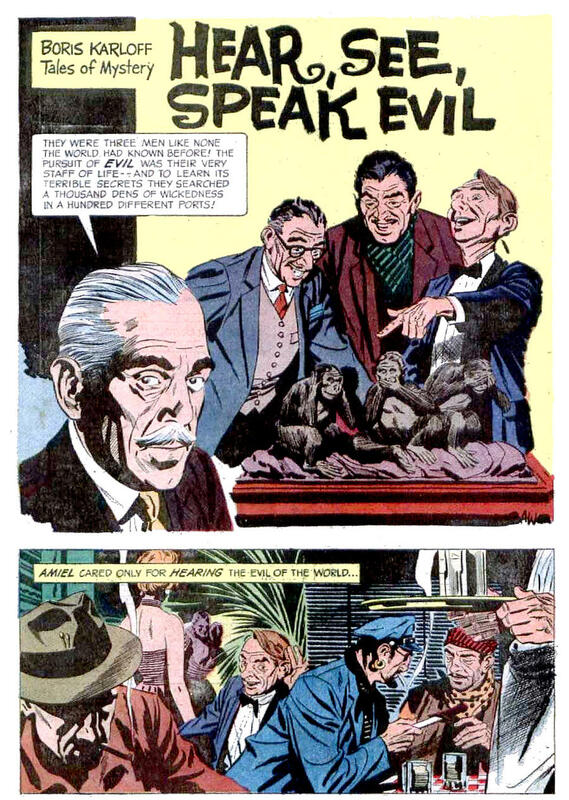 The popular maxim, “See no evil, hear no evil, speak no evil,” often accompanied by three monkeys with hands over their eyes, mouth and ears, comes from at least the 17th century (Japan) and maybe even further back to the 8th century (China). 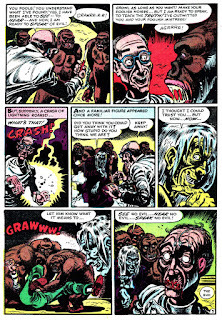 It has different meanings based on one's interpretation, but for the sake of the two stories I am showing today, it is about people seeking evil. 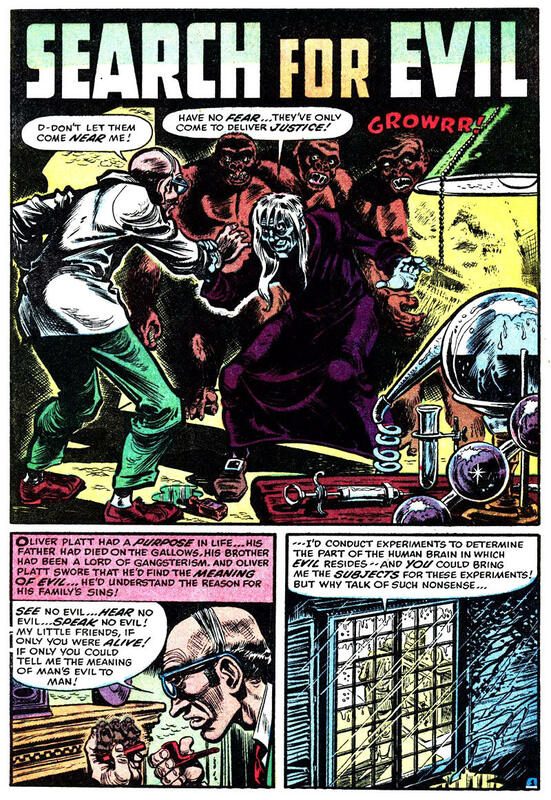 It may or may not be clever to base a story on such a familiar trope, but it seems a natural for writers of horror or mystery stories. 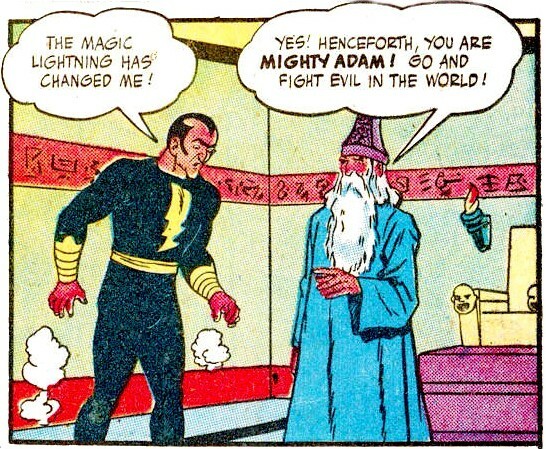 When in doubt, go to what is familiar. 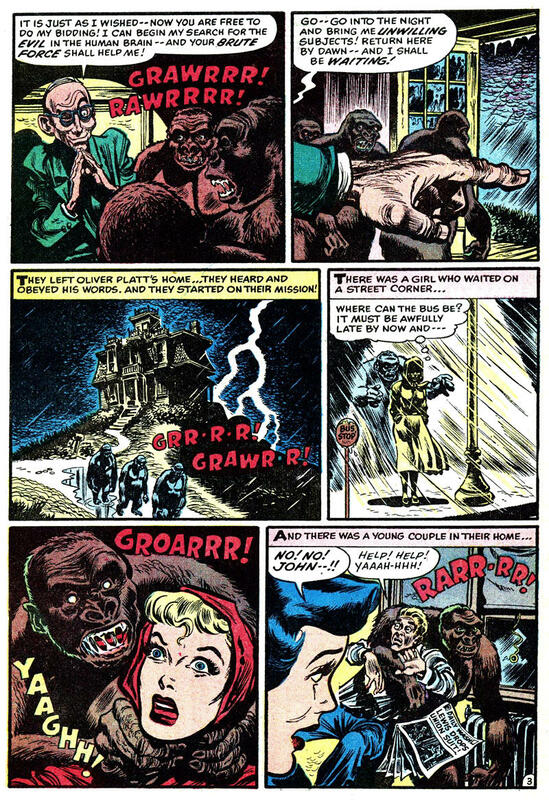 And, of course I chose the stories because they feature apes! 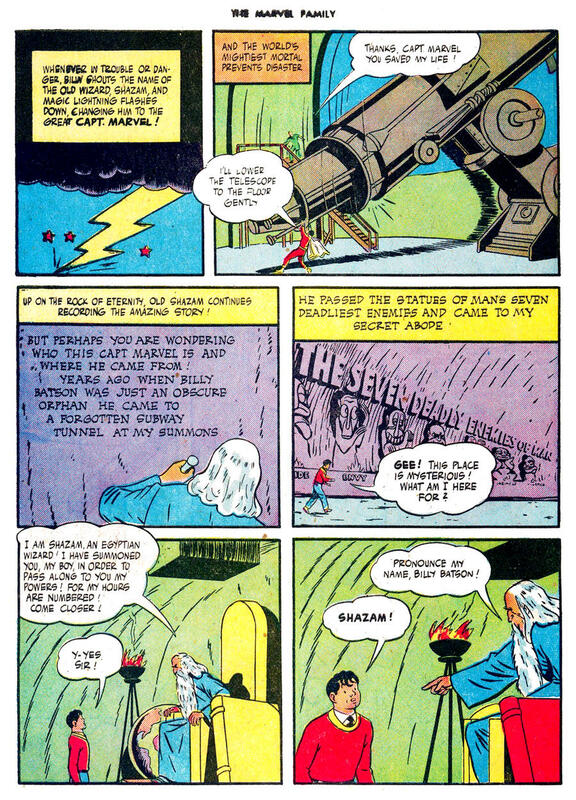 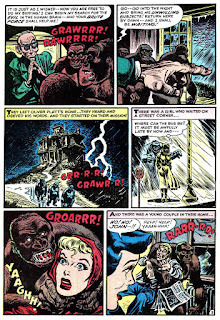 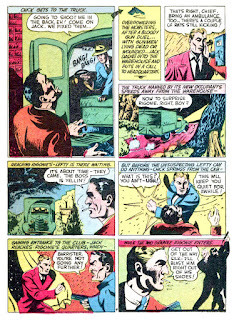 “Search for Evil” is from Harvey’s Black Cat Mystery #44 (1953). 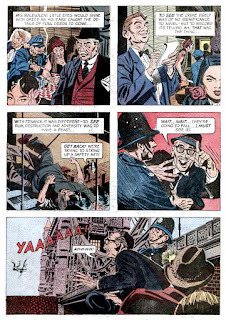 No scripter is listed by the Grand Comics Database, but the artist is Howard Nostrand. 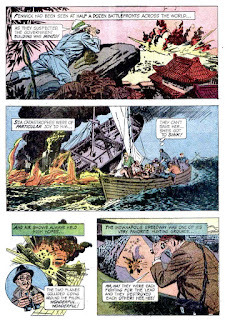 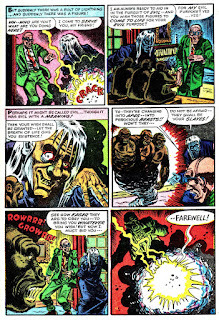 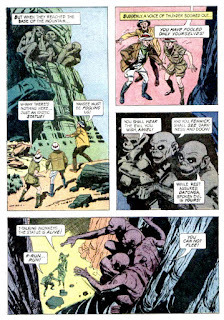 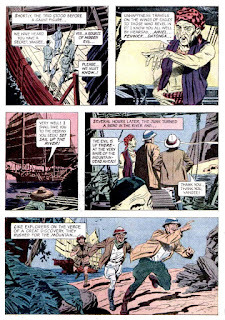 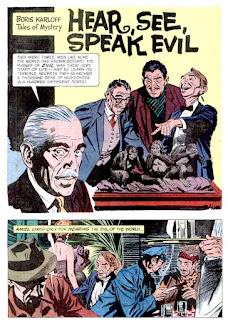 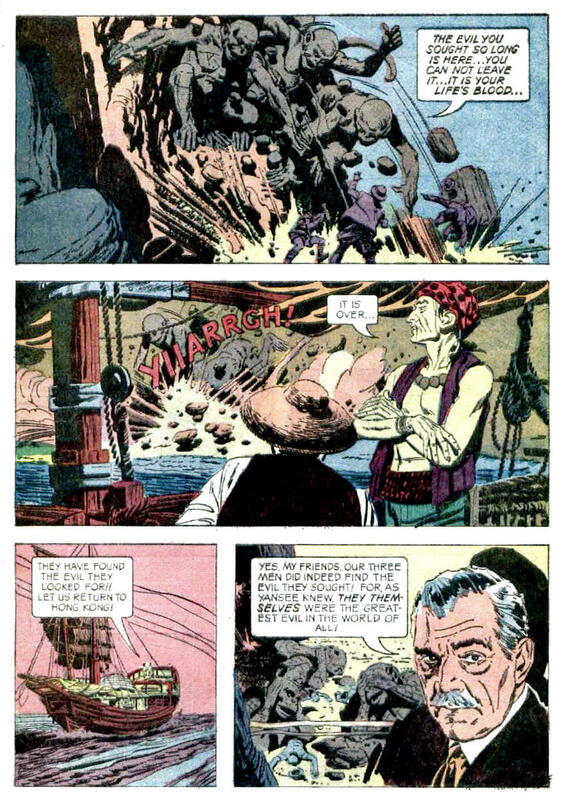 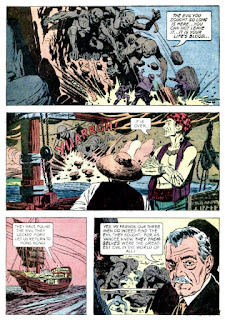 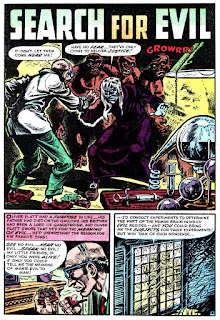 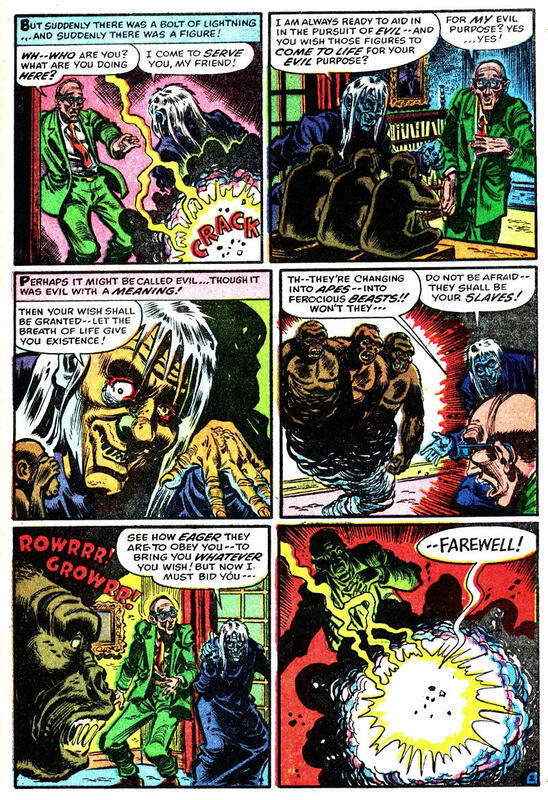 ”Hear, See, Speak Evil” is from Boris Karloff Tales of Mystery #11 (1965), published by Gold Key. Again, no scripter, but the artwork is signed “AW” — Al Williamson. Number 2198: The Eye Sees...and speaks! 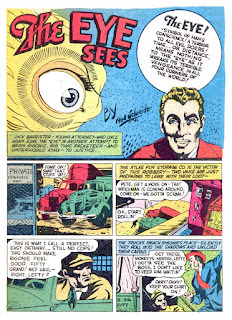 The only talking eyeball (as far as I know) in comics was a minor hit in the short-lived Centaur Comics stable. 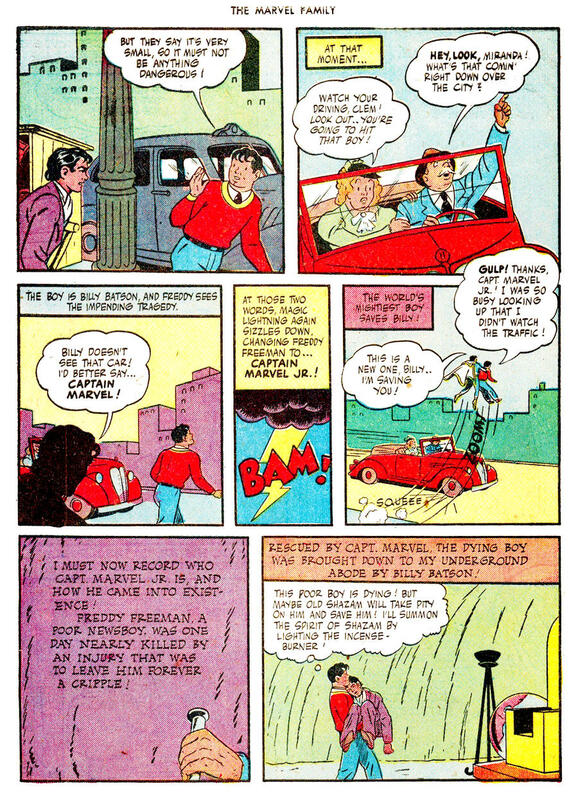 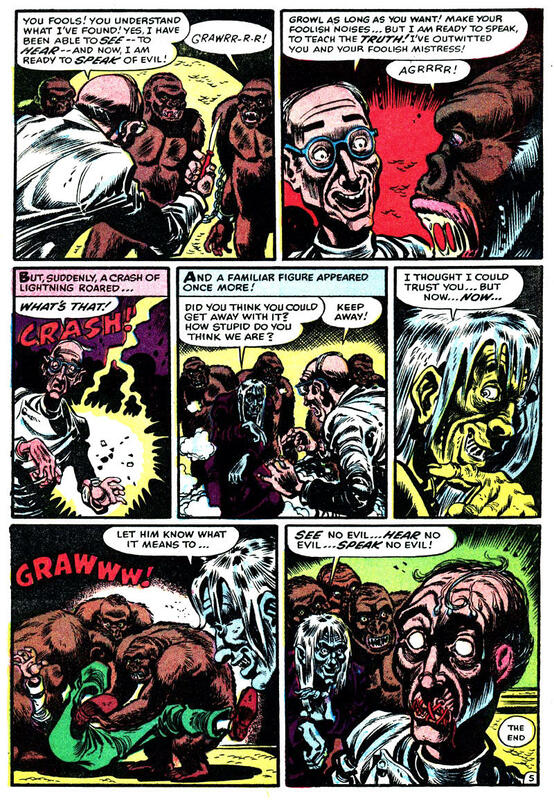 Created by Frank Thomas (“The Owl,” “Billy and Bonny Bee”), the strip was turned over to Mark Schneider, who made his comic book debut with Centaur. 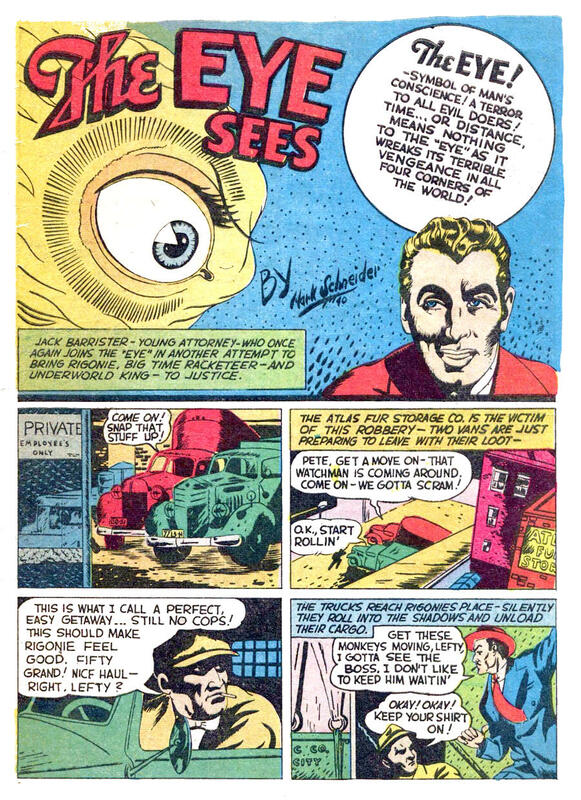 Schneider’s artwork on “The Eye Sees” is crude. 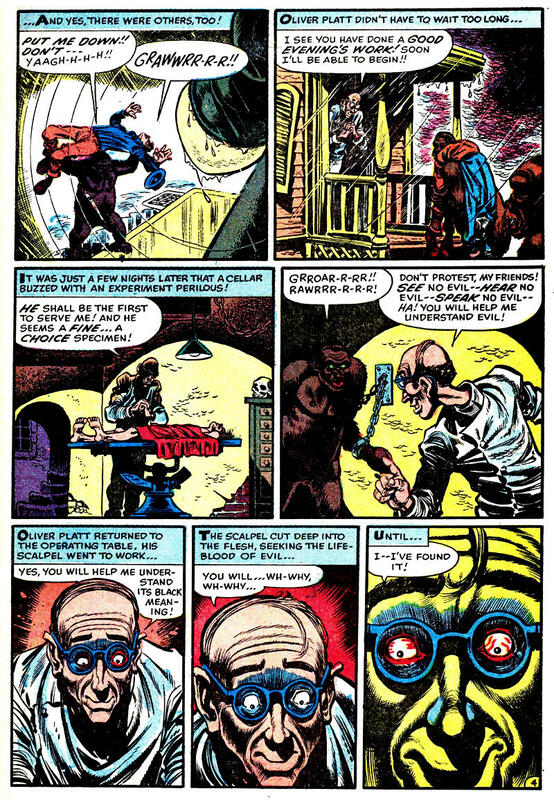 Luckily Schneider got better. 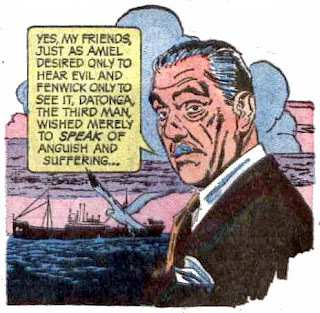 He joined the staff at Fawcett. 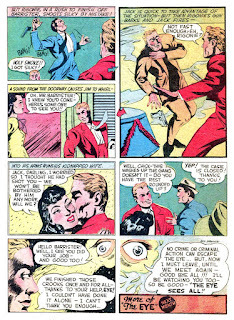 He was in the Army during World War II, then came home and continued his art career. 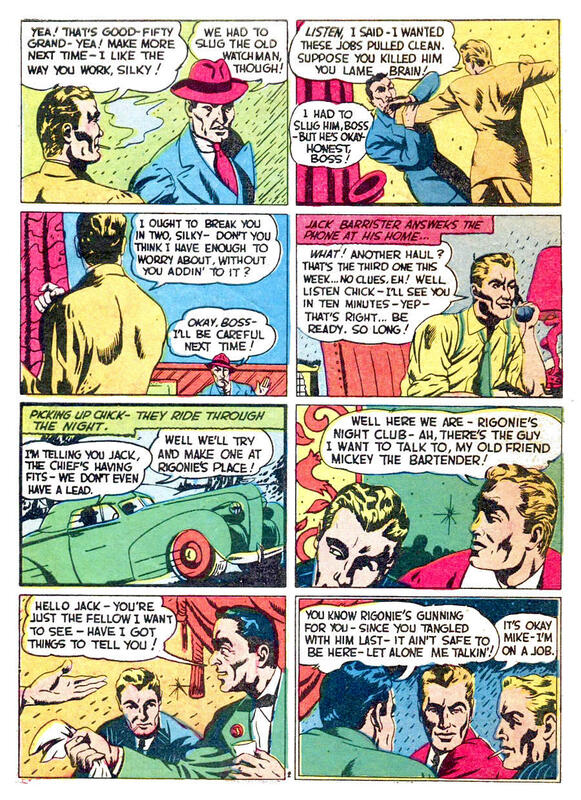 Eventually he got into painting covers of men’s magazines. 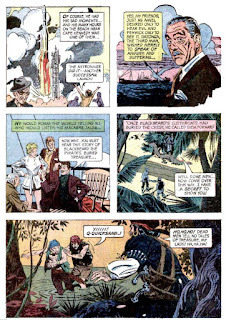 I have a couple I scanned out of the book, Men’s Adventure Magazines, published by Taschen. It looks like he used the same model for all his females, but that isn’t unusual for artists. 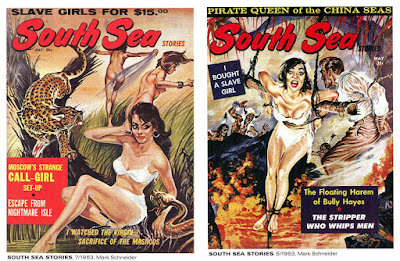 David Saunders has an excellent capsule biography of Schneider on his Pulp Artists website. 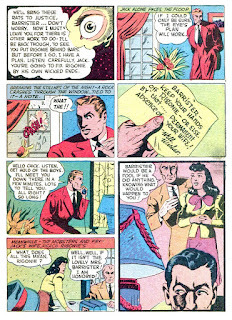 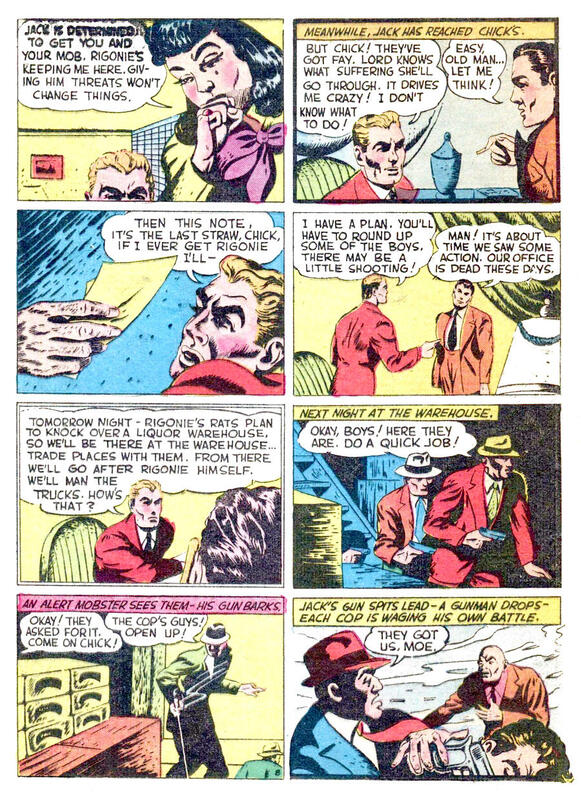 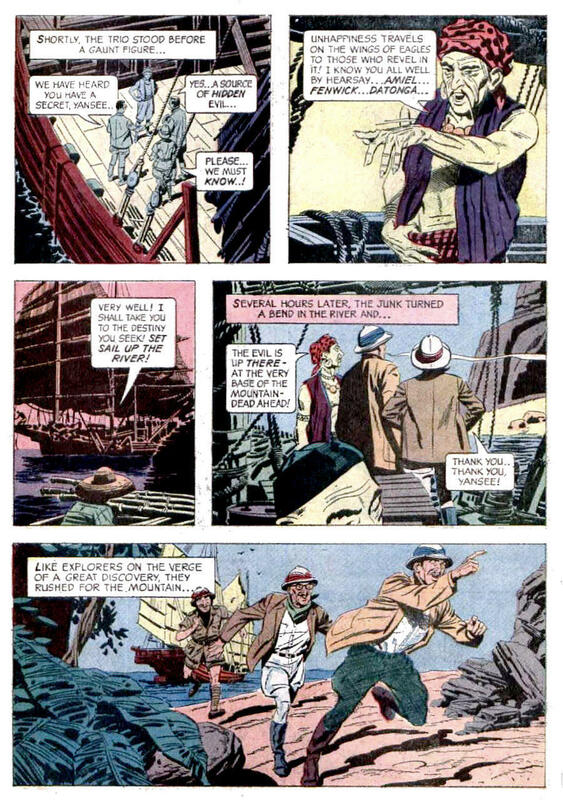 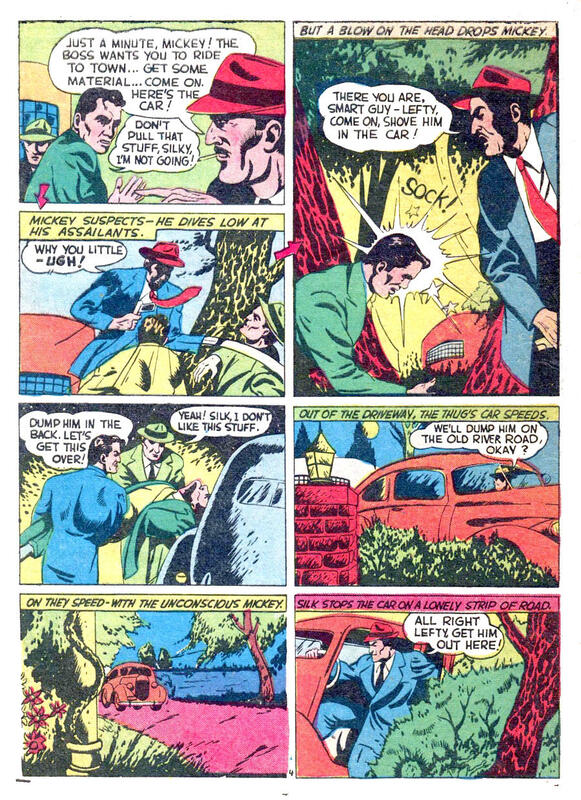 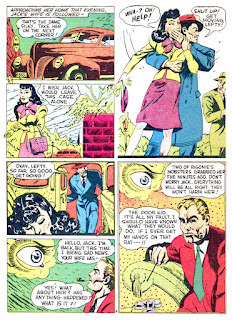 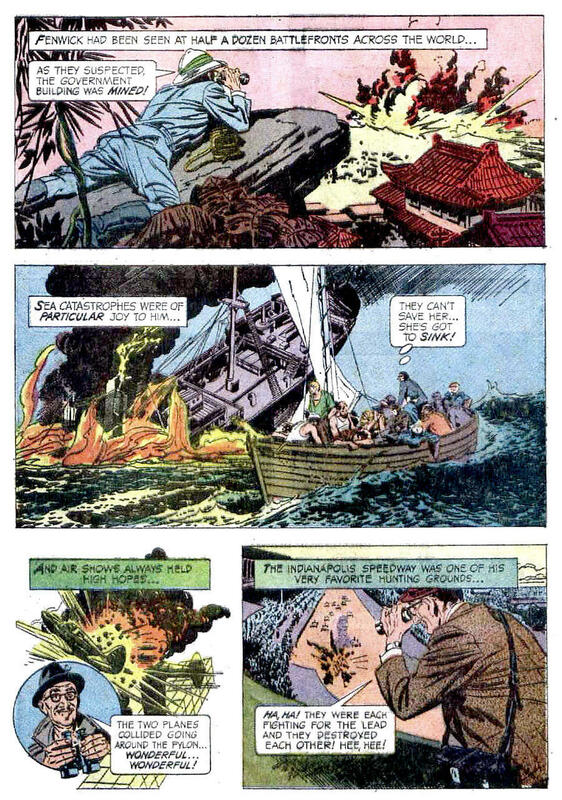 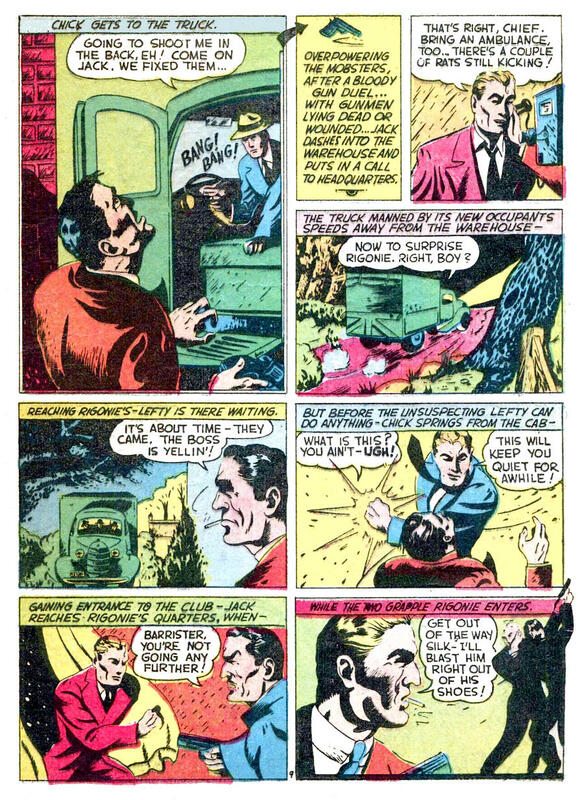 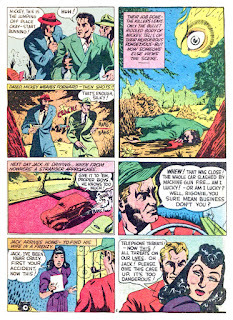 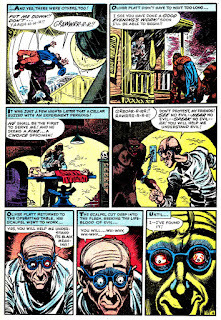 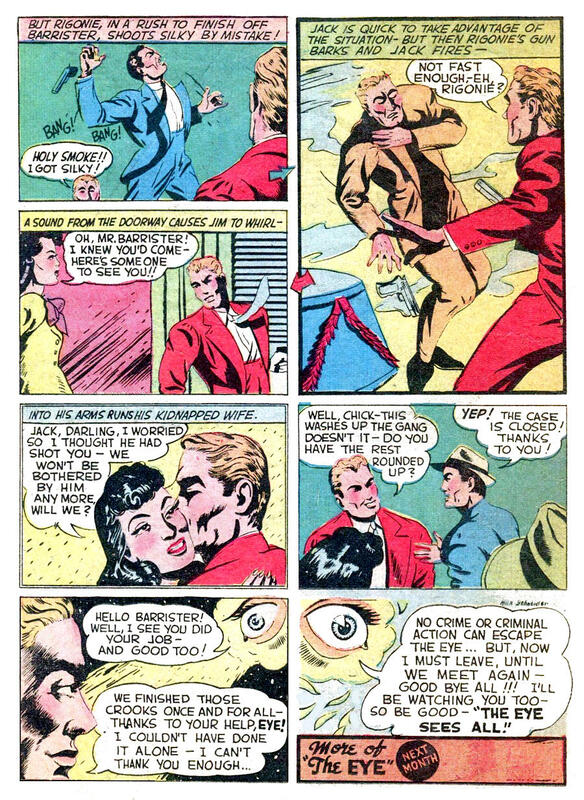 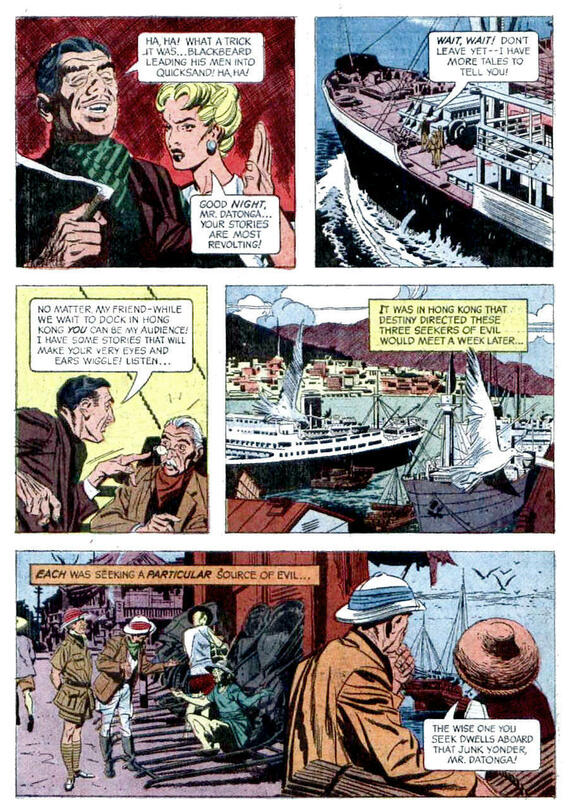 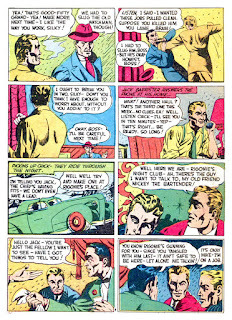 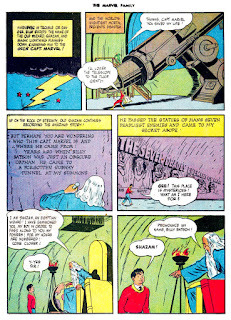 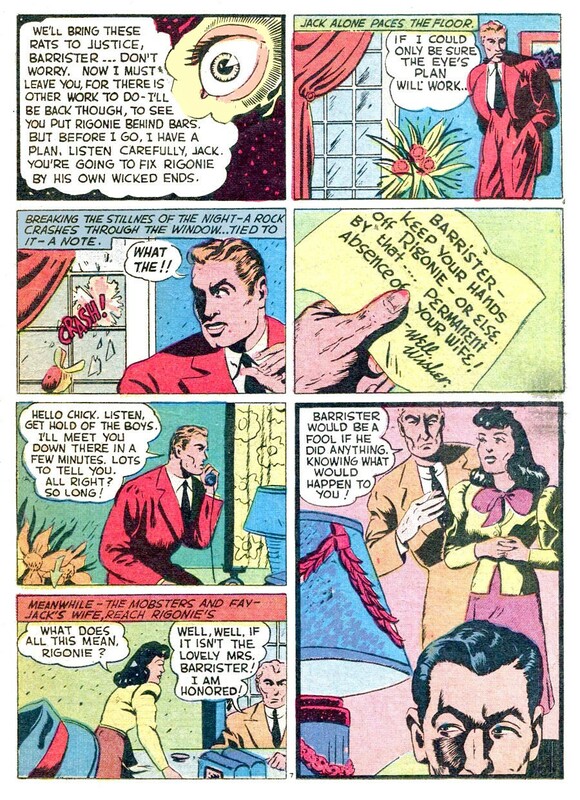 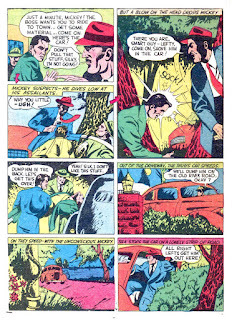 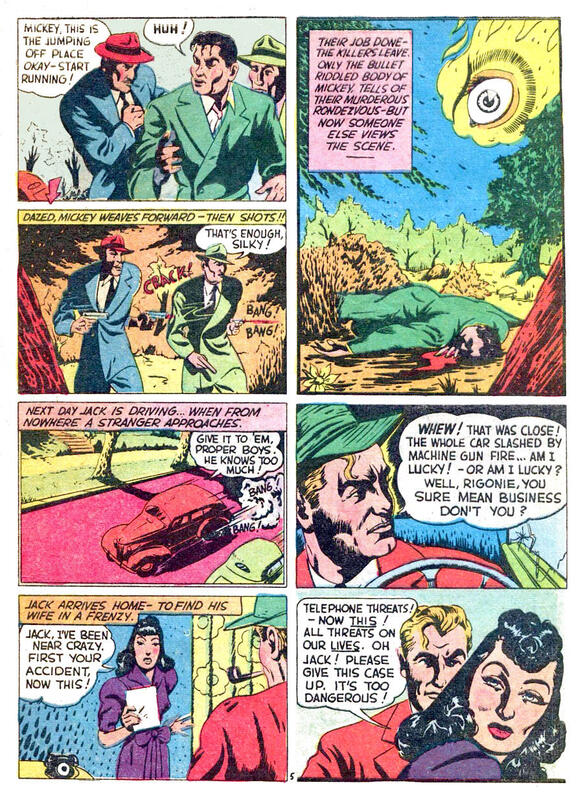 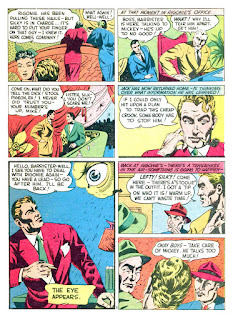 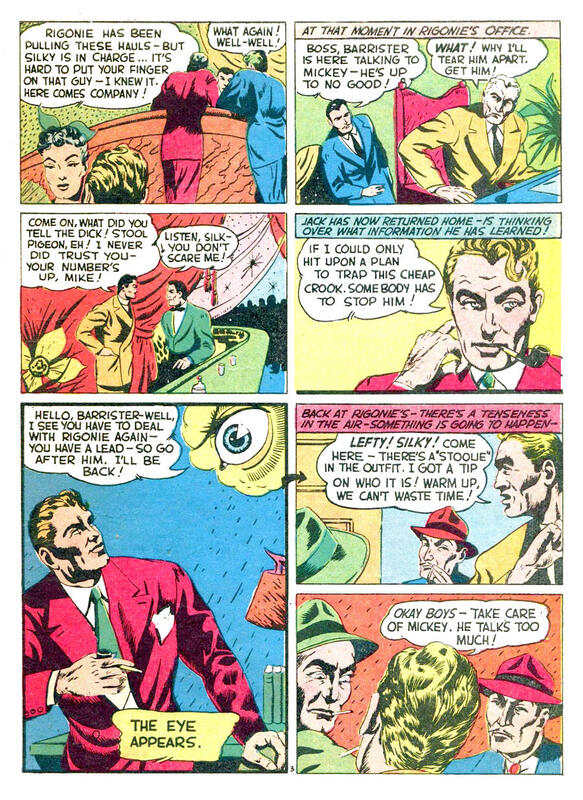 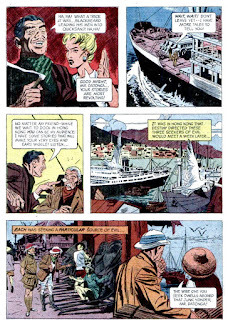 The story is from Detective Eye #1 (1940). 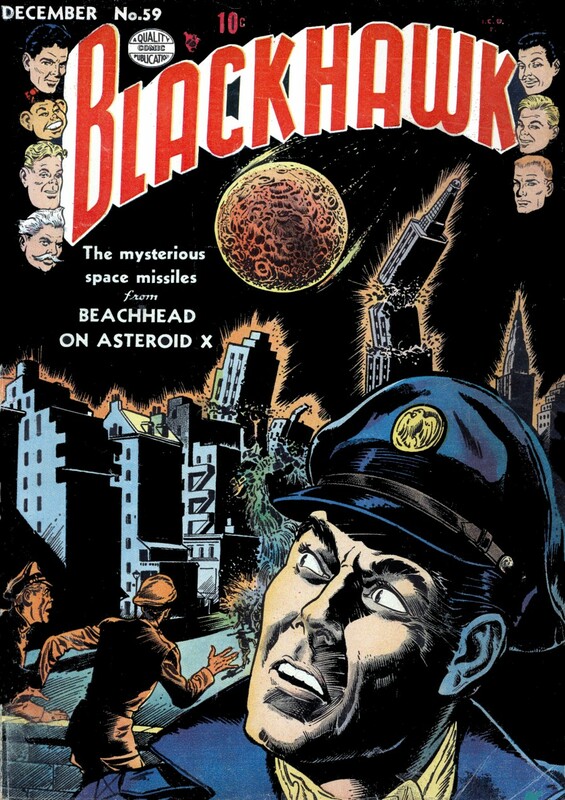 I looked at the cover of Blackhawk #59 (1952) and it brought to mind fears of a huge object hitting our planet and making us like dinosaurs...extinct. 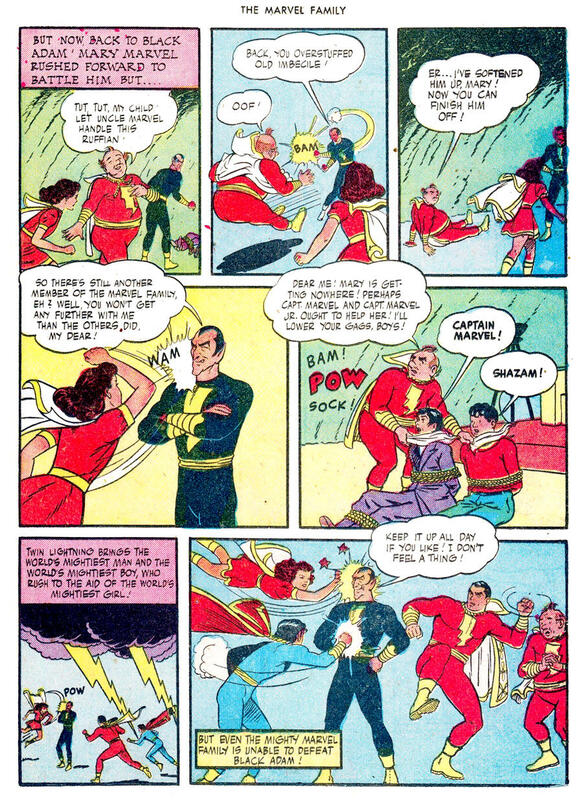 I was able to shake it off. 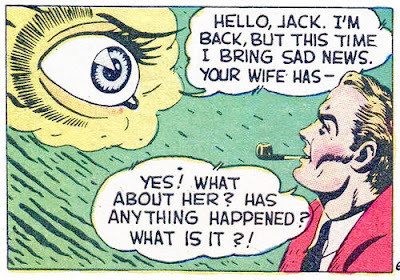 After all, a miss is a miss. In this tale it isn’t the fear that an asteroid is about to hit Earth that is the problem, it is that an “aggressor nation,” (and we all know who that is, don’t we?) 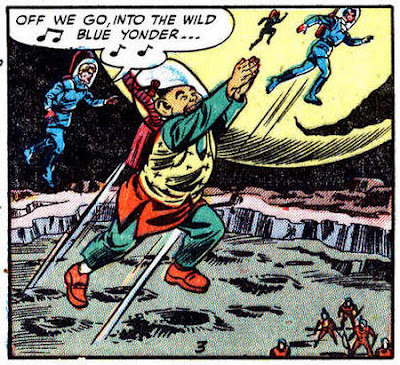 has set up a base on said asteroid, ready to rain down death on America. 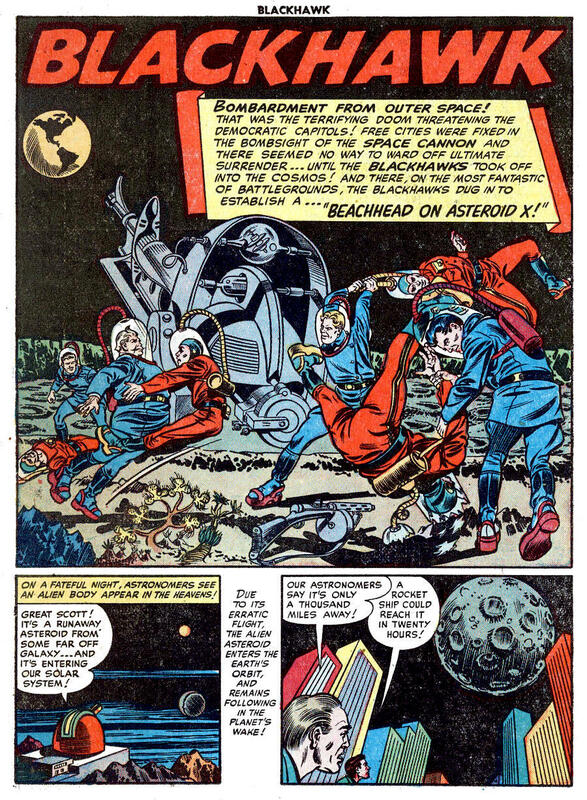 America has only one rocket ship ready to fly to Asteroid X, and it can accommodate seven, just the number of Blackhawks! What luck! 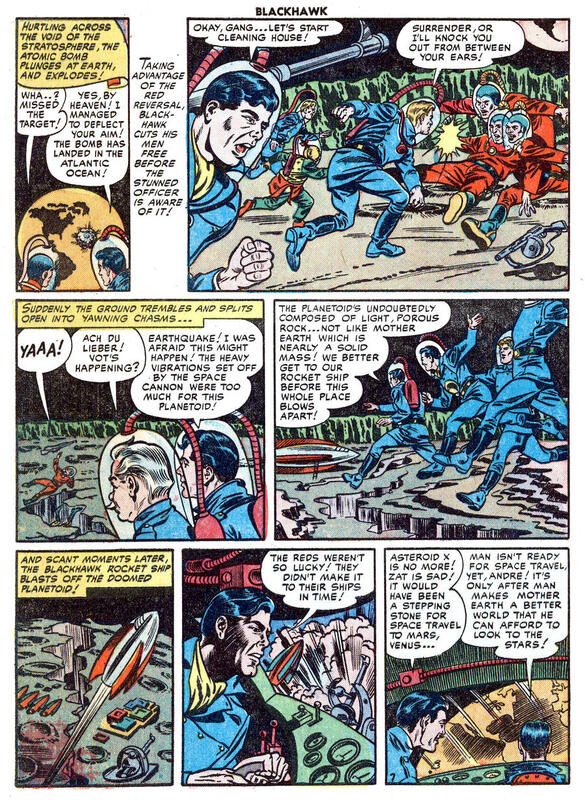 Except for the out-of-this-world environment, it is a battle story. 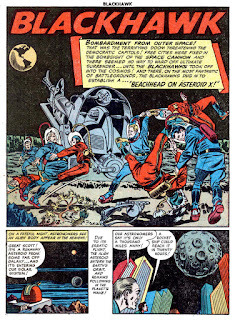 I don’t know who wrote “Beachhead on Asteroid X.” The Grand Comics Database gives Bill Ward ? (question mark means it is a guess) credit for the artwork. 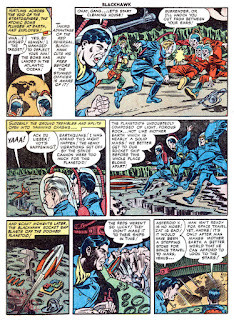 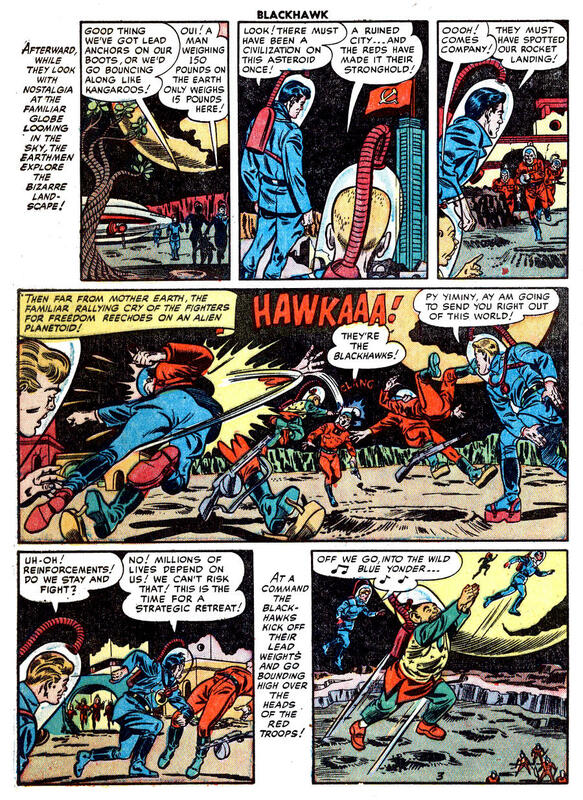 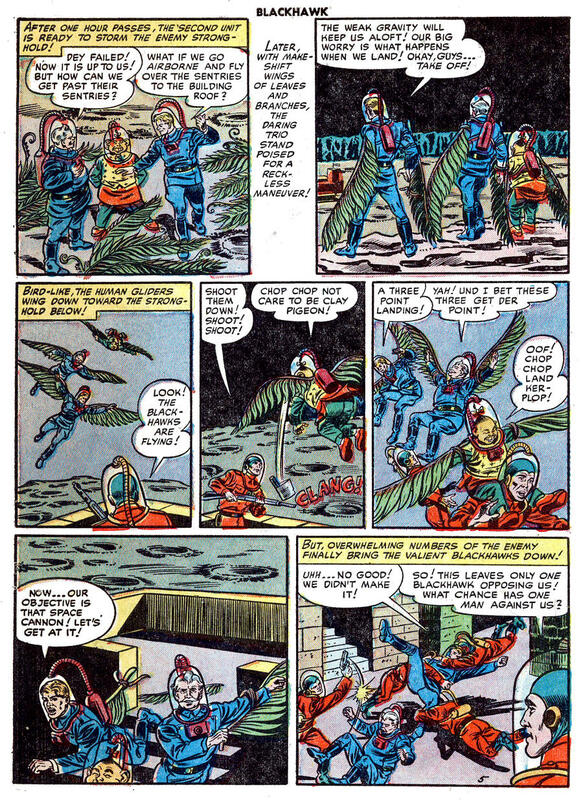 I am torn by opposite opinions: even though I am for the exploration of space, I also tend to agree with Blackhawk’s opinion in the final panel. 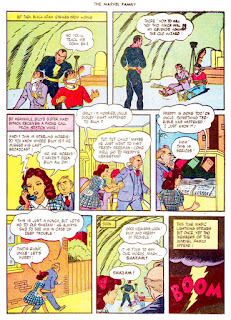 Number 2193: Albert the Alligator sings! 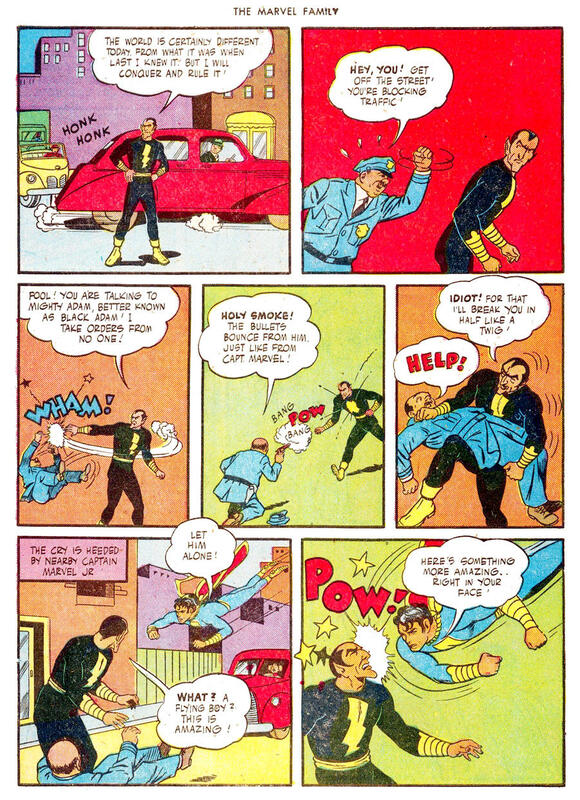 Number 2189: Now Junior, behave yourself!